Just past Thursday I attended an Autodesk Fusion 360 Meetup in Novi, Michigan. I figured it was a little bit of serendipity, that I just happened to be in in Novi for some PLM360 training. Attending the event was a must. A moral imperative, if you will! So I sat down at the event with my laptop and began watching the presentation. Watching the presentation and building models! I'll say straight up, I knew many of the steps, but I learned long ago to try not to "check out" of a presentation. There's always a gem if you know where to look. Here's one I'm going to share with you! Embedding a model view on a website! The first step is to locate the file you want to embed in Fusion 360. In my case, I'm going to share the connecting rod from my post yesterday. 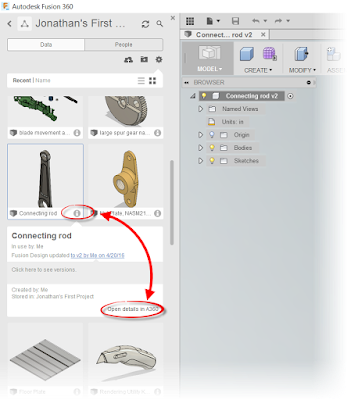 But now, instead of just pasting in a picture,like I did above, I'm going to embed a 3D model view into the model! The first thing to do is to locate the file in Fusion's data panel and click on the 'i' symbol to expand the flyout under the component. Once you'll see the option to "Open Details in A360". Click on that link and the file will open in A360. Click on the link in A360 for a pleasant surprise. 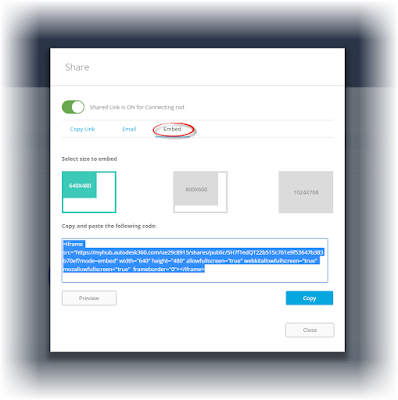 Selecting this link will open a window that will show you the options to Copy Link, Email, and Embed. 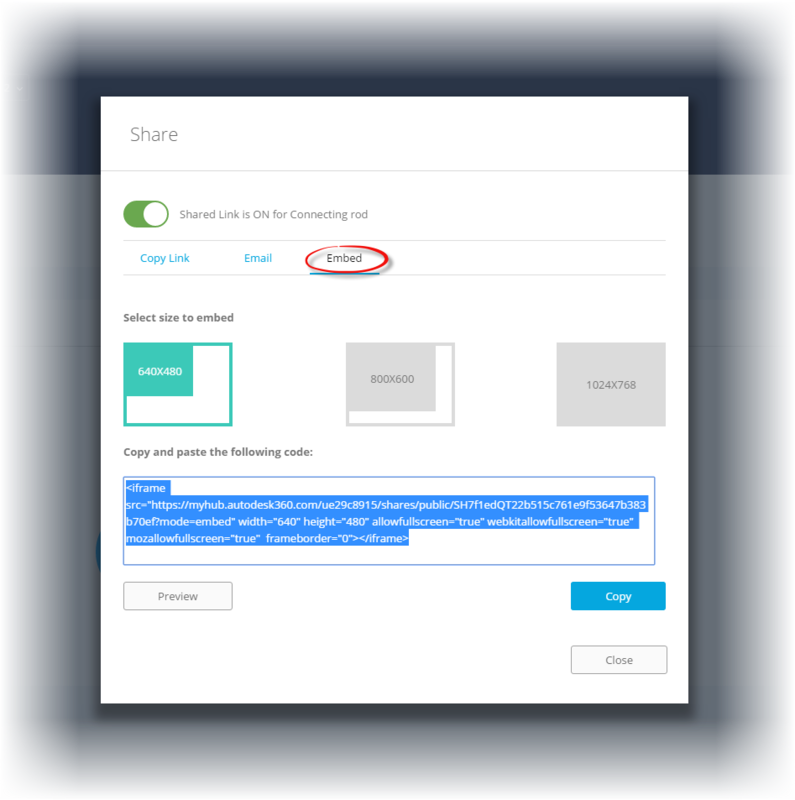 Since we're embedding, embed is the option we're going to choose! Once you have that, choose your size, and click the "Copy" button to paste the embed code into the destination. Once you have that, you're ready to go! You'll have a viewable file that you can embed in a webpage just like I have below! Oh! One other trick! If none of the sizes presented by A360 work for you, locate the "Height" and "Width" settings in the embed code. You can tweak them to the size you want! For my blog, I use 545 x 307, but you can always experiment with what works best! Feel free to edit the embed code. In my previous post I mentioned that I was going to start diving headfirst into Autodesk Fusion 360. So taking advantage of a business trip to Detroit, that's what I've been using my evenings to do! It's not that I've never used Fusion, but most of my work has been confined to a few hours here, followed by a months long hiatus. Rinse... Repeat. In other words, I only dabbled in it. It's a transition for sure! I've used Inventor since the year 2000. I know that program, and I'm comfortable in that program. Having worked with a CAD program for that long, and putting some long hours into using it, it becomes tempting to keep it obsessively close. 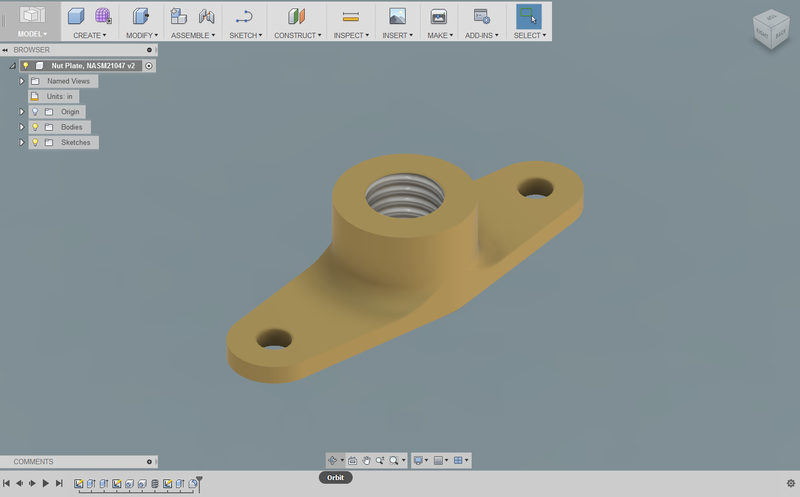 But I told myself that I had to have an open mind, and judge Fusion 360 on its own merits. "Because its not Inventor!" is not reason enough to dislike Fusion. So far, I've just been trying a little part modeling. I just found a few samples and began building models. 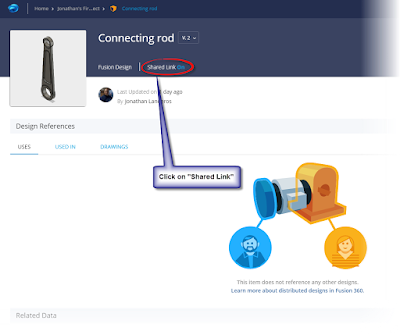 I didn't start out with something complicated, like the Eiffel Tower or a Boeing 737, I just picked a few simple parts, and started getting acquainted with Fusion! A connecting rod I "Made up". You can find this part at this link. So what did I do? I just built! I built parts, used the tools, and just got used to how Fusion 360 works! And so far, having tried simple part modeling, I like what I've seen. 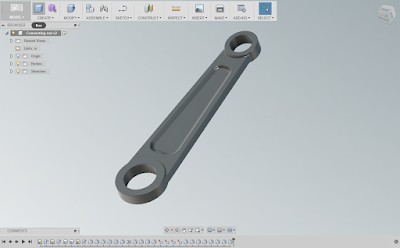 Many of the tools are similar to what I've used in Inventor, and I'm getting used to a few of the differences I've found so far. But I'm going to be looking at more than part models. I already have a few colleagues I may be collaborating on projects with, and I see potential for doing a little 3D printing. And I've already tried my hand at sharing files on this blog! So stay tuned! I'm enjoying the experience, and there will definitely be more to come! I know I've been bad about posting, but I really do have a good reason! For the last four weeks, I've been taking another Aviation Maintenance class at Mount San Antonio College. This class was "Induction and Fuel Metering Systems". That meant studying carburetors, fuel injection, superchargers, and turbochargers, among other details. For four weeks, this was home. It also meant working 6am to 4:30 PM Monday through Thursday, followed by class 5:30PM to 10:30PM, Monday through Friday. In other words, a schedule fueled by momentum and caffeine, lots of days being the first out of bed, and the last to sleep at night, and being grateful for a supportive family who understands that I'm nearly invisible these four weeks. But it's also incredibly rewarding, and dare I say fun, and as always, educational. Why? Because I love the subject, and I love learning something new. One of my projects was a 100 hour inspection of this RV-6's engine. But classrooms are only the start. Life is the biggest classroom of all, and it loves to change the lesson midstream. It's up to us to adapt to it! So what does that have to do with InventorTales? Winds of change, that's what! I no longer have access to a license of Inventor at home, which is where I write my blogs. And as much as I wish I could, I don't have the means to get myself a license of Inventor. I could close up shop, and turn off the lights on InventorTales. After all, it's been a heck of a run! 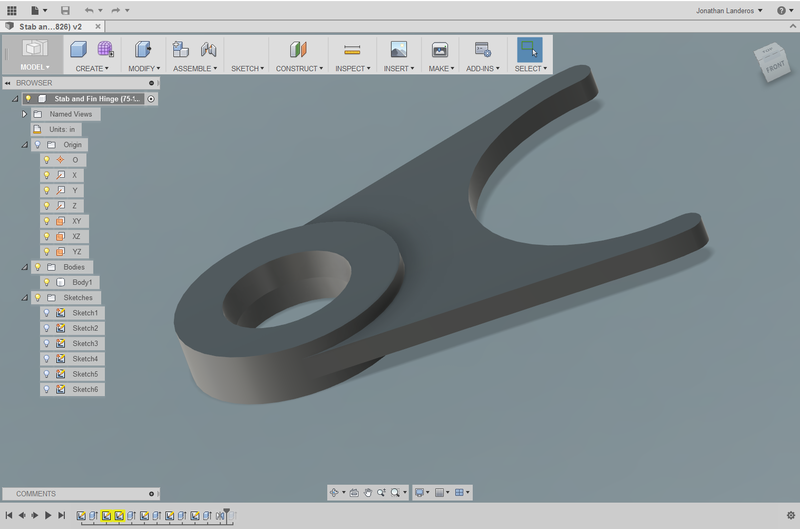 But why do that when I can use Fusion 360. Like a sailboat changing course to take advantage of the wind, I'll be working with this program for my home projects. Of course that means I'll be stepping out of my comfort zone, the Inventor that I've used for 15 years! Will it be easy? Probably not. Will I get frustrated? Probably. But we don't grow if we're not willing to be a little uncomfortable, so this is what I'm going to do. Stay posted, and feel free to follow along as I head off in a new direction with my CAD experience!